UPDATE: Public Safety Detectives are asking the public for assistance in identifying the suspects from the shooting incident in the 2700 block of Westbrook Ave. this afternoon. A composite drawing was completed on one of the suspects from the shooting. 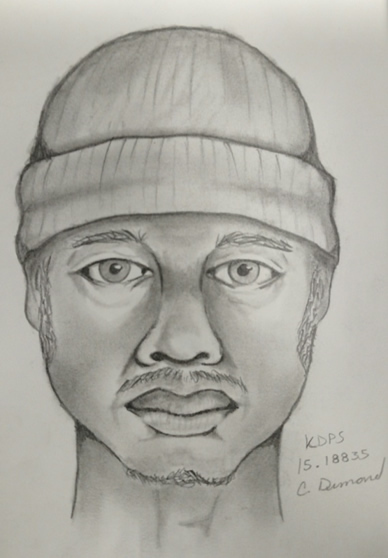 He is described as an African American male with light complexion. He is about 5’9” tall and 160lbs. He is described as being approximately 20-28 years old, wearing a white thermal long sleeve shirt, black jeans and a gray stocking cap. He also has a mustache and goatee. Please see the attached composite drawing. Kalamazoo, MI: Public Safety Officers were sent to the 2700 block of Westbrook Ave. on a report of shots fired. Moments later, the victim of the shooting called police to report his injury. The victim was shot multiple times by an unknown suspect while the victim was inside his apartment. The victim is a 20 year old Kalamazoo City resident. He is currently undergoing surgery at Bronson Hospital. The investigation is ongoing and there are no suspects in custody for the shooting incident at this time.